Your Trusted Crowd allows you to share your Trust Deed purchase with your investment associates and friendsnfamily. We foster a trusted, intimate community-oriented environment for investing. Registrants can essentially form a venture alliance to take advantage of the direct investment model of CrowdTrustDeed and co-invest with their friends and colleagues. We're excited to bring the innovation occurring in FinTech, Crowdfunding and peer-to-peer lending to trust deed investing. 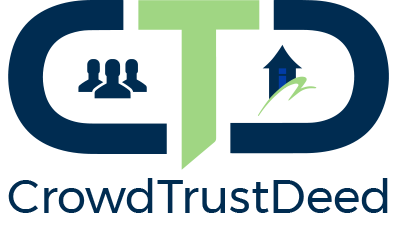 CrowdTrustDeed solves the challenges that all trust deed investors face today - building and managing a dynamic trust deed portfolio. If you're a real estate developer looking for a new source of fast and reliable capital, or a qualified investor who wants to diversify your portfolio within a new cash flow based asset class, join your Trusted Crowd today at CrowdTrustDeed. Trust deed investors understand the significant benefits of a diversified high yielding portfolio of trust deed investments that provide monthly income. But, they're challenged by today's offline process resulting in stale offerings, inconsistent due-diligence, no centralized deal source, limited ability to select co-investors, no visibility into payoff timing, re-investment challenges, lack of liquidity, and multiple unconsolidated statements. Our mission is to solve these challenges by moving the process online, by providing information in real-time, and aggregating information in one place - CrowdTrustDeed. Over 10.00% Average Return! 100% Return of Capital! Since the founding of our parent company in 2007, our investors have averaged >10.00% interest, as a return on capital, with no loss of principal. In this same time frame, our investors have received 100% return of their capital. While past performance is not an indicator of future performance, we provide transparency into the total actual returns our investors achieve investing on the CrowdTrustDeed platform. Website Design by Marcel Bagrin.